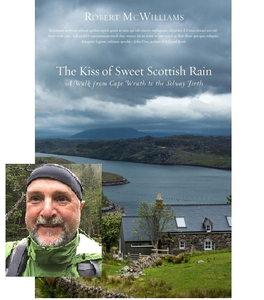 Please join us for an exciting talk by travelogue author, Robert McWilliams as he takes us through his recent adventures in Scotland and the writing of his new book, The Kiss of Sweet Scottish Rain. McWilliams is a Scottish-born transplant to Connecticut who undertook this ambitious trek entirely on foot as an obstinate ambition and start of a new direction in life. His story crosses wild and beautiful landscapes, intersects with an ever-changing cast of characters, and passes through communities from remote hamlets to the smiling, but rough-edged city of Glasgow. The book is a great read for anyone who loves hiking, adventure, or travel. Please click https://greathollow.org/event/author-talk-and-book-signing/for more info. A Q&A and signing will follow the talk, and copies of the book will be available to purchase.